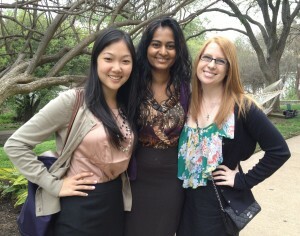 My MPA friends and I at a recruiting event last week. With all this recruiting, the CPA exam is the last thing on our minds. Hey everyone! A lot of my friends are starting to sit for the CPA exam and I realized that I probably don’t know enough about the exam or what it entails. There is so much online about the CPA exam and I will share some of my findings with you! First, you have to qualify to sit for the exam. The AICPA does a great job at covering anything and everything you would want to know about qualifying for the exam in their Uniform CPA Candidate Bulletin. Next, be sure to know the specific rules that your state requires. UT does a great job at helping MPAs to meet the Texas exam requirements. Some of which include: 150 semester hours and a BBA degree, 30 upper division accounting hours and 24 related business hours as well as a 3-hour ethics course. What is great about McCombs is that when we graduate we have met the educational requirements- even the ethics course! As far as preparing for the exam, I haven’t started since I am just a third-year, but I know it takes a lot of disciplined studying. There are many different prep courses and I would definitely recommend talking to the 5th-year MPAs to see what they have used to study. Lastly, there are 4 sections of the exam; Financial, Regulation, Audit, and Business. Since MPAs love acronyms and abbreviations, you’ve may have heard the sections referred to as FAR, REG, AUD, and BEC, respectively. FAR and AUD both contain 90 multiple choice questions and 7 task-based simulations. REG has 72 multiple choice questions and 6 task-based simulations. And finally, BEC has 72 multiple choice questions and three written tasks. It is quite a lengthy exam which is probably why each section is taken separately. The CPA exam seems so far in my future, but it is good to be prepared before starting the process! Good luck, everyone!